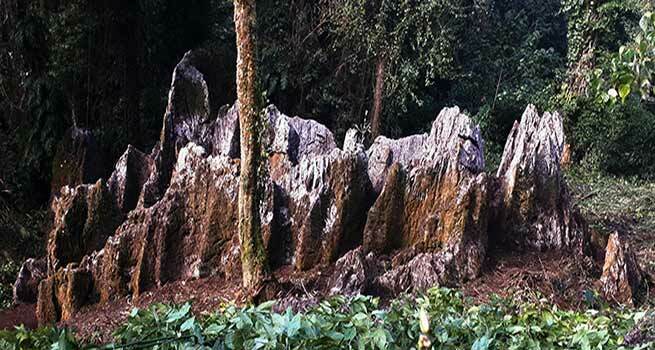 One natural Shivalingam and a number of unique sculptures created by nature in the Mountains of Arunachal Pradesh have been discovered by the Tarh Welfare Society (TWS) with the support of local people in ‘Langa Tata’ and ‘Rayung Dumchuk’ mountain range in Kra Daadi District of Arunachal Pradesh. A team of local people lead by TWS General Secretary Tarh Tarak who visited the Rayung Dumchop and Langa Tata mountain range claim to have discovered a unique sculpture which would be converted into a tourist spot. Tarak informed that there is rich history and folklore surrounding the Langa Tata mountain located in the vicinity of the Yangte area. This mountain has several fountains, caves and huge stone carving which might have been created by nature. There is a big Shivalingam at the entry point of the sculpture. The area covering around 1000 sqmtrs consists of around 8 big stone curved standing straight. He said, that the Shivalingam which the locals call as “Pelang Sangri’ , believe to be a living stone and blessing received to those people of the area and it is a replica of the group of mountain Rayung Domchuk and Langa Tata. The preservation and protection of the site will be done by Tarh Welfare Society and for which several subcommittees will be constituted. An expedition team of TWS and several social service groups have also been undertaken recently to expose the site. Leader of Opposition and Palin-Chambang MLA Takam Pario said that Arunachal is a virgin land and it is very good that the local people have discovered such a beautiful and a unique site which needs to be developed into a tourist site. The government also should ensure that it could be developed into a tourist place which will also the benefit local people of the area. Yangte ZPM Tarh Monika while said that this is her first visit, she would take the matter with the district administration and state government including the local MLA for exposure to the outside world of this unique spot for visiting of tourist in the area. Kra Daadi Deputy Commissioner Pege Ligu informed that it is really good to learn about such site and he will sent officers of district administration to ascertain and study about the structure found in Yangte Circle soon. Geological Survey of India Director P. K. Singh said that few people of Yangte Circle have approached the department few weeks ago and explained about the existence of some sculpture there. Speaking about such structure, Singh said that the structure was created naturally due to weathering. Expedition team leader Tarh Tumbu who said that on December 14 2017 that they led a 57 member team of youths who visited the area and cleared the jungle and also tried to make a footpath on the mountain site. Since then several attempts were made to clear the jungle so that the visitors do not get trouble in future. However the administration and government need to take care of the structure and site.